Catherine Reinhart is an artist living and creating in Ames, IA. She received her BFA in Integrated Studio Arts – Printmaking and Fiber in 2008 from Iowa State University. 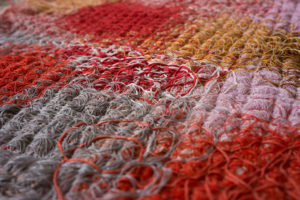 In 2012, she completed her MFA in Textiles from the University of Kansas. Her works have been exhibited locally, regionally and nationally with works in Southern Graphics Council Print Collection and Archives at the University of Mississippi in Oxford, Mississippi and the Print Department Permanent Collection at Seika University in Kyoto, Japan. She is also a member of the Surface Design Association.